FORT DRUM, N.Y. (Aug. 9, 2012) — Soldiers from 2nd Battalion, 15th Field Artillery Regiment, 2nd Brigade Combat Team, 10th Mountain Division, and Soldiers from 5th Battalion, 82nd Field Artillery Regiment, 1st Cavalry Division, of Fort Hood, Texas, fired M777A2 “triple seven” howitzers during a live-fire training exercise held Aug. 4, in Fort Drum’s training area. 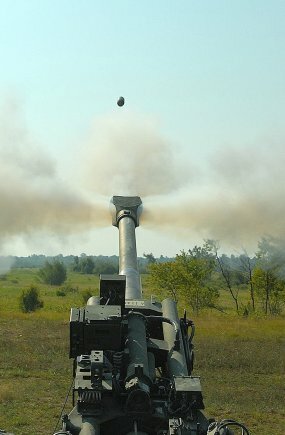 The live-fire exercise marked the end of a two-week familiarization course and began a display of firepower not seen on Fort Drum in about a decade. Putting what they learned to the test, Soldiers staggered the triple sevens in a “Lazy W” formation. About 10 Soldiers stood by each weapon system ready to receive their fire missions, load 155mm high-explosive rounds, fire the weapon and destroy the targets roughly eight miles away.